One of the great side benefits of being a Realtor is having the opportunity to get inside of truly extraordinary homes. There is one house in particular that I have wanted to get into for years. When I returned to Lake Oswego 13 years ago, this house was just being built. The construction took years. Unlike most homes that are built in 4 to 6 months, this house literally took years. Now I know why. Villa Teresa was open to Realtors during the weekly broker’s tour last Tuesday. My thanks to Joelle Lewis, the listing Realtor with RE/MAX Equity Group, for hosting the open house. And also for allowing me to share her gorgeous listing with you here on the propertyblotter. Pictures do not begin to convey the grandeur of this house. I don’t mean grandeur as in large or huge. I mean grandeur in that you feel like you are visiting a home that is rare and exquisite. Every surface of everyroom is a work of art. From floors inlaid in artistic parterns with 7 or 8 different types of wood, to one-of-a-kind chandlers made in Italy of Murano glass. This house took so long to build because it was built by artisians using absolutely the finest materials. The house is listed for $4,600,000. 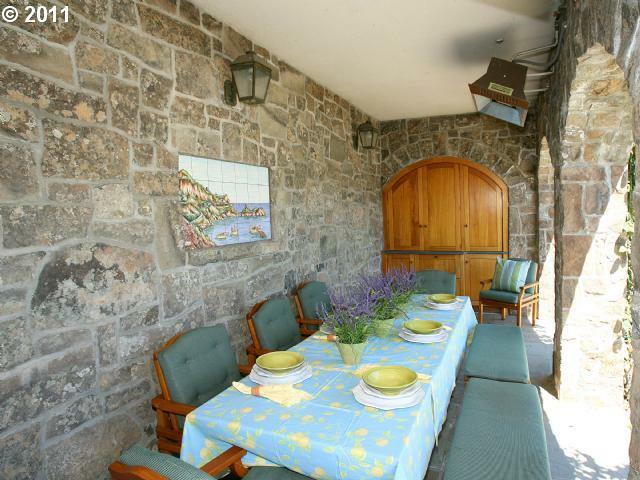 It has 5800 square feet with 4 bedrooms, 5 1/2 baths, a den, a wine cellar, and a card room. This is in addition to the livingroom, familyroom, kitchen and normal living spaces. The house is fully wired for high tech with consoles placed discretely throughout. There is a little booth off of the kitchen with a desk for going on-line and taking calls. I have had the great good fortune of traveling in Europe and I can tell you that I have never been in a home that truly makes you feel transformed to Italy. There is even an al fresco dining terrace with spray misters for hot summer days. Topping off this house is its waterfrontage on the coveted Northshore of Oswego Lake for maximum sun exposure. No, actually, there is one more little item that tops off this house. It has a guest house next door that is also for sale. The guest house is faced completely in stone. It has 7500 square feet that includes an in-door swimming pool. This house was built but not finished as the home owner was relocated to another state before its completion. It is on the market for $3,400,000. So who buys these sorts of homes? Obviously people with money. Business owners, executives, celebrities, and people who are able to afford the finest lifestyle available. The pool of buyers for homes such as these is pretty limited, so it can take awhile for a house of this nature to sell. 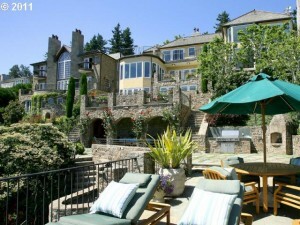 There are currently 12 homes for sale in Lake Oswego priced at over $3,000,000. In the last 3 years, during this terrible economy, just 3 houses priced over $3,000,000 have sold. Interestly, each one of these 3 sales had no real market exposure. 2 sold in zero days and 1 sold in just 8 days. In other words, the buyer and seller were brought together either through friendship or mutual acquaintance. There is one house currently pending that is on the Willamette River that is pending for $4,395,000. It has 3.89 acres, 7527 square feet, 6 bedrooms, and 7 1/2 baths. And, of course, Jantzen Island is still for sale. I have never gotten into that house. Like Villa Teresa, it is a Realtor goal of mine to see the interior. Built in 1930, the house and guest house combined have 13,500 square feet. This property is special because it sits on a private island that is actually 5 lots of one acre each. When you consider the house, guest house, and potential land value, it may actually be worth the asking price of $15,000,000. It is uncomparable to anything else around. Perhaps wealth is not as fashionable as it has been at other times in history. But a truly magnificent home will always be a dream, and for a few, a reality. Now here is a sobering thought. The property taxes for the Jantzen Island are $99,000 a year. I hope you have enjoyed this little peek into the world of high-end homes. I know that I have. And I especially am happy that I finally got to see inside of Villa Teresa. Thanks Joelle.